Monitors how much the trailer sways and helps correct it. If you tow a travel trailer RV you know all too well how scary a sway event can be, especially when making emergency maneuvers at high speeds or dealing with heavy crosswinds. Our patent pending Sway Command Tow Control Technology takes away those fears and promotes safety by applying the trailer brakes before a sway event can get out of control. Utilizes both an accelerometer (measures lateral force) and gyroscope (measures angular velocity) to quickly and accurately differentiate between side-to-side and up-and-down movement to prevent false activation. This is especially useful off road. The competition uses only accelerometer technology. Advanced patent pending microprocessor technology electronically detects trailer sway and applies the trailer brakes to suppress unwanted sway. 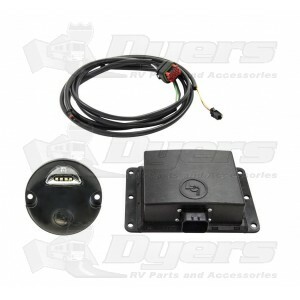 Light pod mounts to the front of the trailer and signals to the driver when the system is functioning properly. Rigorously tested in sway-inducing towing conditions, including emergency maneuvers. Controller works independently from existing brake control so that in the case of a short or disconnect in the tow vehicle connection, Sway Command won't be affected or vice versa.